This is really happening. 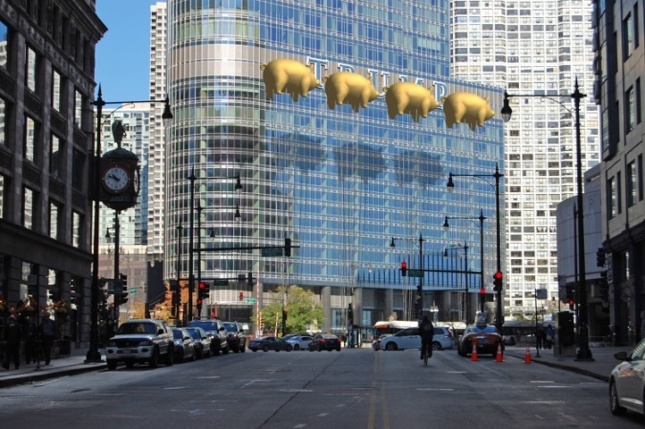 Late last year Chicago-based New World Design proposed Flying Pigs on Parade: A Chicago River Folly, an installation of four golden flying pigs directly in front of the Trump sign on the Trump International Hotel and Tower. After receiving permission from Roger Waters, co-founder, bassist, and lead songwriter of Pink Floyd, New World Design will reproduce the same pig used for the iconic Pink Floyd photo shoot over Battersea Park Power Station, London, for the Animals album cover. This time the pigs will be gold. 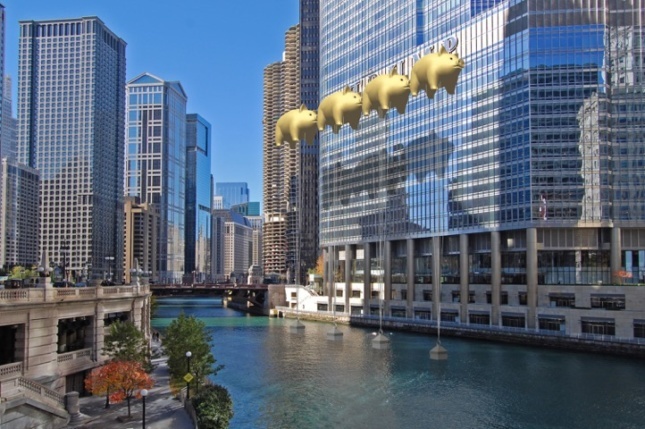 The helium-filled balloons will then be floated, single file, from a construction barge in the Chicago River at just such a height to obscure the 20-foot-by-141-foot Trump sign. The single day installation is expected to be launched in late August or early September. 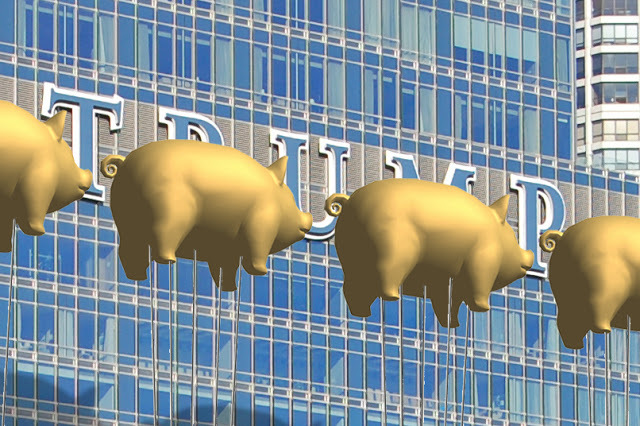 The pigs hold multiple meanings and make a number of pop culture references, most clearly to the 1977 Pink Floyd album cover and George Orwell’s Animal Farm. Other references include Trump’s alleged “Miss Piggy” comment directed at a former Miss Universe and the gold so often used in Trump’s interior design. “The design follows meticulous rationale in imparting layers of meaning but ultimately allows for interpretation by individual viewers,” said Jeffrey Roberts, partner at New World Design. The Trump Tower has become a lightning rod for protest since the election. The base of the tower has been the site of multiple peaceful demonstrations, and the Honorary Trump Plaza sign, which marked Wabash Avenue in front of the tower, was removed some months ago. On any given day, tourists can be seen across the river taking selfies of themselves giving the building the middle finger. As reported by the Chicago Tribune, another consequence of Trump’s lack of popularity in Chicago has been slowed condo sales. Currently, over 50 condos in the Tower are on the market. That is nearly three times that of any similar tower in the city. The pigs and the protests are all happening in a public way, peacefully. So it would seem that the targeting of the tower by scornful Chicagoans is not going to stop anytime soon. Not even when pigs fly.